Barack Obama’s approval rating slipped back down into the 30s this week. 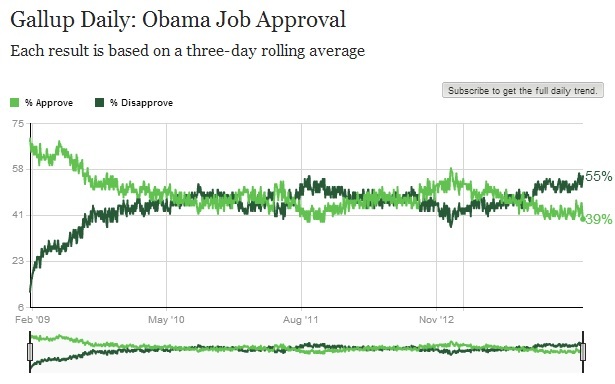 Obama’s approval rating is currently at 39% . This comes after Barack Obama finally admitted this week that despite his previous promises – You can’t keep your doctor under Obamacare. The New York Times admitted today Obama has become “poisonous” to Democrats. Democrats are becoming increasingly alarmed about their midterm election fortunes amid President Obama’s sinking approval ratings, a loss in a special House election in Florida last week, and millions of dollars spent by Republican-aligned groups attacking the new health law. The combination has led to uncharacteristic criticism of Mr. Obama and bitter complaints that his vaunted political organization has done little to help the party’s vulnerable congressional candidates. The latest in a cascade of bad news came Friday when Scott Brown, a former senator from Massachusetts, announced an exploratory committee to challenge the incumbent Democrat in New Hampshire, Senator Jeanne Shaheen, and when the Republican-aligned “super PAC” American Crossroads said it would spend $600,000 to help his effort. Earlier, another top-tier Republican recruit, Representative Cory Gardner, decided to challenge Senator Mark Udall of Colorado; the two races create unanticipated opportunities improving Republicans’ chances to take control of the Senate. No prominent Democrats predict their party will win back the House. Interviews with more than two dozen Democratic members of Congress, state party officials and strategists revealed a new urgency about the need to address the party’s prospects. One Democratic lawmaker, who asked not to be identified, said Mr. Obama was becoming “poisonous” to the party’s candidates. At the same time, Democrats are pressing senior aides to Mr. Obama for help from the political network. You can only fool the people for so long.